In September this year I lead a nine-day photographic safari to Botswana with two great friends from Wimbledon, England. It was the first time Martin Milton and Stuart Jennings had set foot in the Kalahari, where we spent three days glamping (yes, that’s five star camping and includes everything from hot bucket showers to a bar man on duty 24/7), before heading for the Linyanti Swamps and Okavango Delta in search of their first ever sighting of African wild dogs. 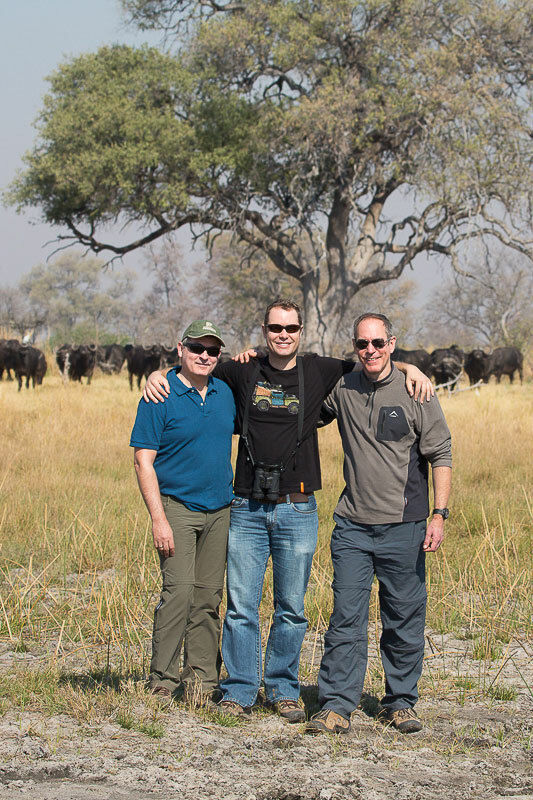 Martin, Villiers and Stuart on safari in Botswana. 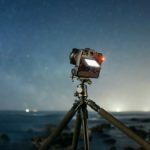 Martin and Stuart’s priority was to get photos of the elusive painted wolves, but I had another shot in mind – a photo that would take time and patience, but would capture the essence of our trip in one single shot: A game drive under the stars. 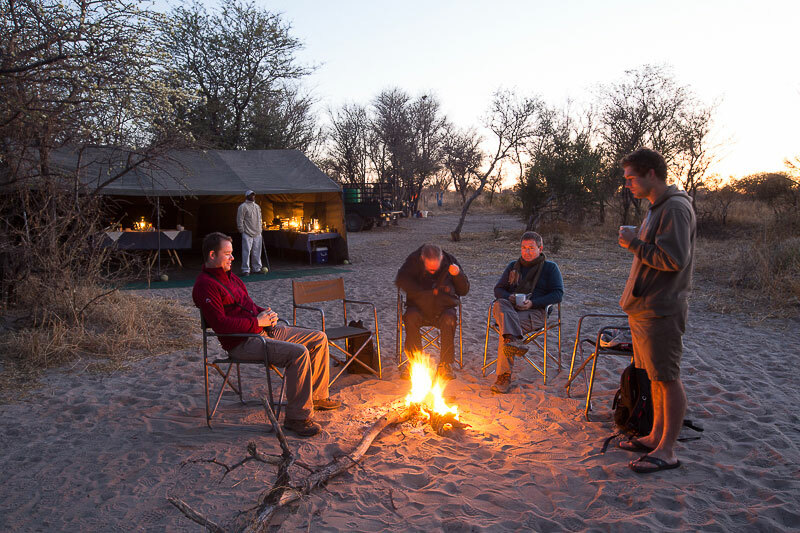 Since we were not allowed to drive after dark in the Central Kalahari Game Reserve, my first attempt was in our remote camp at Letiahau, more than three hours’ drive from the Matswere Entrance Gate. 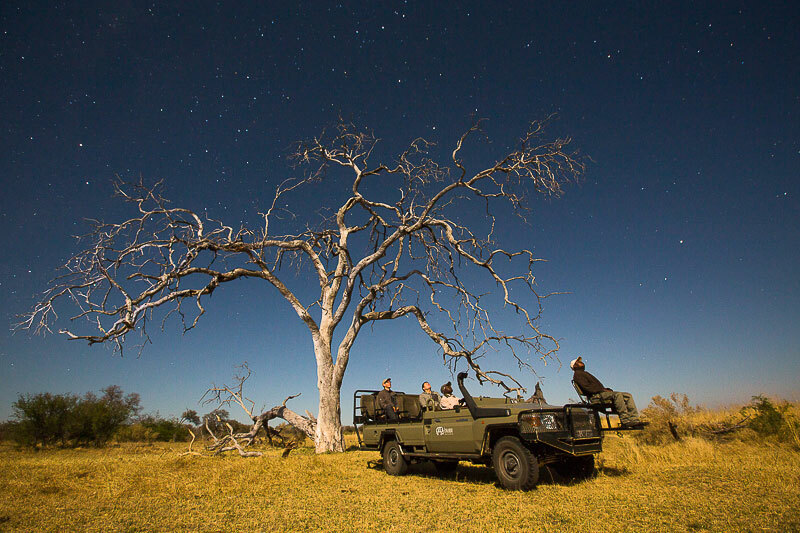 We parked the game viewer at the entrance to our campsite and struck a pose, gazing up at the stunning Kalahari sky. I placed a lantern to our right to light up the vehicle and adjacent thorn bush with gorgeous golden light. The shot looked great, but it wasn’t quite the ultimate safari ‘money shot’ I had in mind – it had to be even more spectacular. Our next stop was Lagoon Camp – a small lodge on the banks of the Linyanti River run by Kwando Safaris. Our guide, Dux Mareja, was one of the best I had ever had the privilege to meet and photograph alongside. Early on during our stay, I asked him to think of the most impressive trees surrounded by open area on their concession. Dux knew just the place. He drove us out to a colossal dead leadwood tree with drooping branches – the kind you only find at the edge of forbidden forests in fairytales. It was perfect, and that evening we returned for the ‘money shot’. 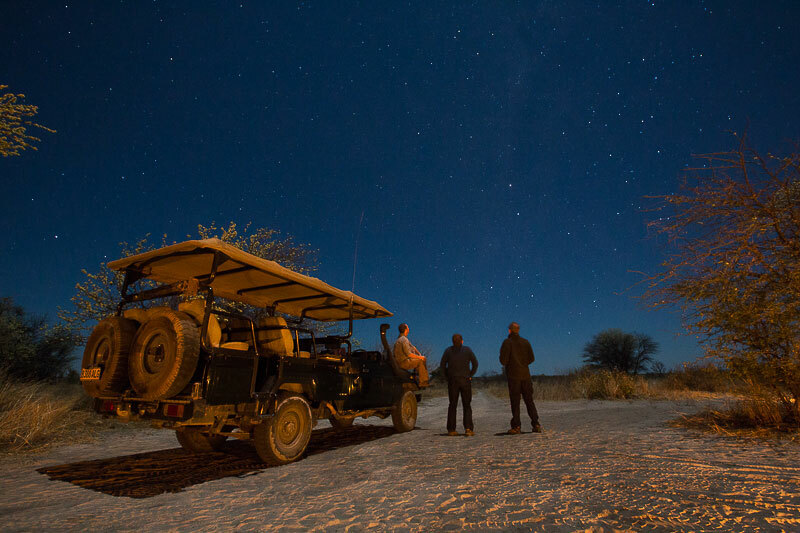 The first star shot attempt in the Central Kalahari Game Reserve. Shortly after 6pm, after a particularly enchanting, hour-long sighting of an extremely relaxed leopardess, we pulled in under the fairytale leadwood tree. It wasn’t yet dark enough to see the stars, but we killed some time setting up our cameras (focussing is always easier when it’s light) and sipped on G&T’s until the sky finally turned black. The timing for this kind of shot was perfect: Over our left shoulders a full moon was rising, not only lighting up our subjects – the vehicle, people and leadwood tree – but also ensuring that the sky appeared blue instead of black, which, for me, packs so much more punch. 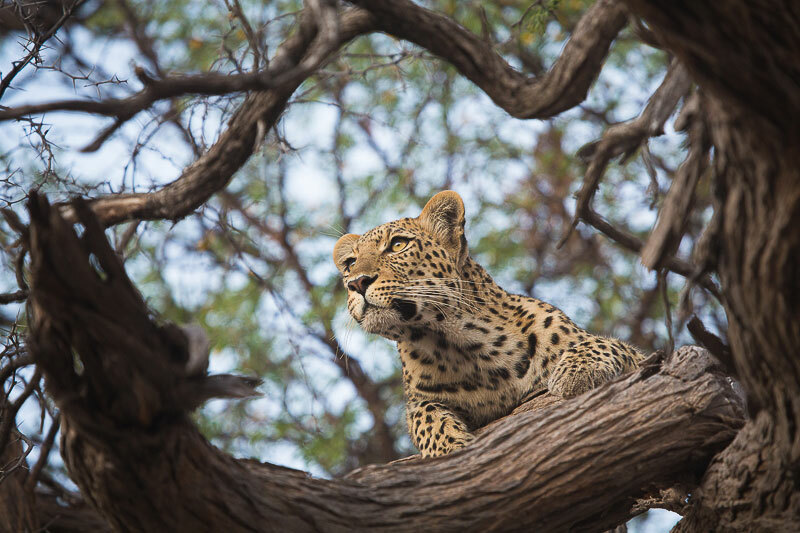 A female leopard entertained us for an hour before we stopped for sundowners. We’d found the right location (open area and awesome tree), so we just needed to park the car in a best position, where it would be lit up by the moon and not block the tree. Placing our cameras on tripods, we all used wide-angle lenses (10-22 mm and 16-35 mm) and focussed on the vehicle while it was still light. The settings on my Canon 5D MarkIII were: Manual Mode, Aperture f/7.1, Shutter Speed 30sec, ISO 1000. The aperture value couldn’t be set too low, otherwise only the Land Cruiser would have been in focus. The shutter had to stay open long enough to expose the scene and it was crucial that everybody on the vehicle sat dead still. To emphasise the character and texture of the dead tree, I shone white torchlight on it from the left during the 30-second exposure – subtly, to ensure that the scene looked as natural as possible. The Safari Money Shot, taken on Linyanti’s Lagoon Camp concession. Despite the fact that it’s not of an animal, this has become one of my favourite safari shots, not only because it looks amazing, but because we planned it right from the start. It was an idea that got us thinking, practising, searching, and eventually executing and celebrating. 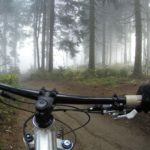 So, where are you going next…and what will your money shot be?